Hate to Cook but Prefer an Occasional Night-In to Enjoy Your St. Barth Villa? As fabulous as St. Barth restaurants are, there are nights you’d just like to relax in that gorgeous villa you rented. Oh, and you don’t feel like cooking. On a recent visit, armed with notebooks and iPhones, we went on a culinary walking tour to give you a few delicious takeaway options. Private chef and caterer Jean-Paul Adley showcases his skills in the creation of French and Creole dishes. You can sample his wares at his little shop in Gustavia. Choose from a selection of salads and daily special dishes. Do try the Conch Christophine. Take-away to your villa or maybe to nearby Shell Beach. 10 rue Victor Hugo, Gustavia; Hours – Mon-Fri 9:00 am – 7:00 pm; Sat: 9:00 am – 2:00 pm. Part sophisticated grab & go and part charming French café, St. Barts Food Lounge has a mouth-watering selection of Mediterranean-influenced dishes and decadent desserts displayed in glass cases. 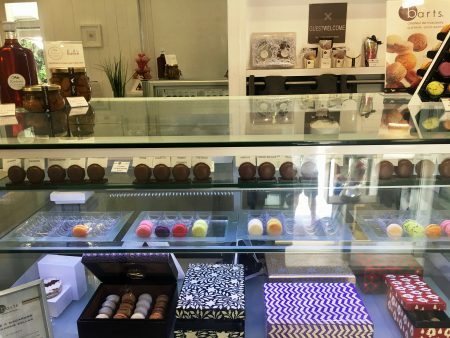 We ogled their Caribbean-colored macarons, reportedly the best on the island and as good as any found in Paris. Sweet. In every sense. You may be tempted to pass on your take-away plans and wine & dine in their pretty portico under a whirling fan. Their pièce de résistance are themed picnic meals and, wait for it – they’ll deliver to the beach of your choice! Picture that. And wouldn’t make a great one? We’re loving their Apéro Picnic. Pick it up after a beach day or that Gustavia shopping spree. Unpack it at your villa, pour that beverage and voila! Apéro ‒ and santé. 19 Rue De Gaulle – Gustavia Harbour; Hours: Daily 9:00 am–9:00 pm. When you are craving a juicy two-handed burger, the heart wants what the heart wants, and there’s a new joint in town. 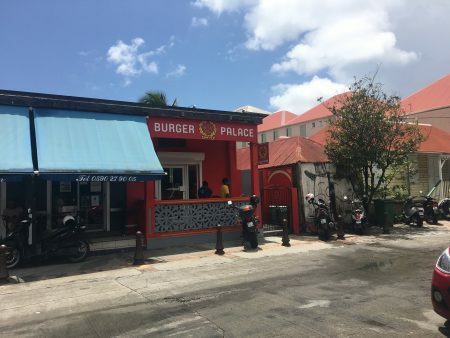 Modestly named the Burger Palace, it’s the size of a shoe box with a menu board listing internationally monikered double and single burgers with a dizzying choice of toppings. (After all, this is St. Barth). A 3€ upgrade gets you a side of frites or a little green salad and a drink from the cooler. There are paninis too but go for the double-burger. You order at the counter and off you go, but if you need instant gratification, there’s a couple of high-top tables just outside. Hours: Daily from 11:00 am; Closing times and late night service varies with extended hours on weekends. This restaurant is located at the Villa Lodge hotel in Grand Cul de Sac and offers Japanese cuisine. Yo is famous for his sushi boats. Pioneering, passionate, demanding, he was the first to import Japanese food in St. Barth. 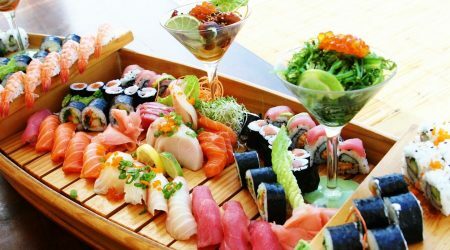 In 20 years, he has become the best in sushi catering and Asian cuisine: tempura, yakitori, Japanese skewers, fried Thai rice…Yo Sushi Mania, is both a restaurant and a catering service. They deliver as well. Open every day in high season for lunch from 12:00 pm to 2:30 pm; dinner from 7:00 pm to 9:00 pm. (Closed Mondays in Value Season). As to delivery, they deliver mostly in the evening; you must place your order before 5:00 pm. 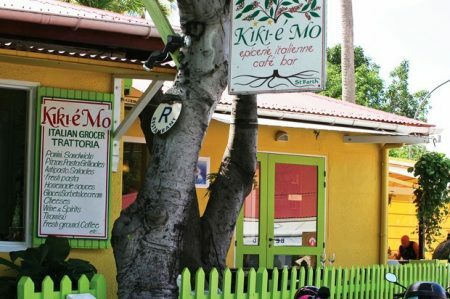 Located across from Nikki Beach, this cute little place offers breakfast lunch and early dinner to eat there as you watch the world go by or to take out. The menu varies with daily specials as well as sandwiches. Open: 7:00 am to 9:00 pm. 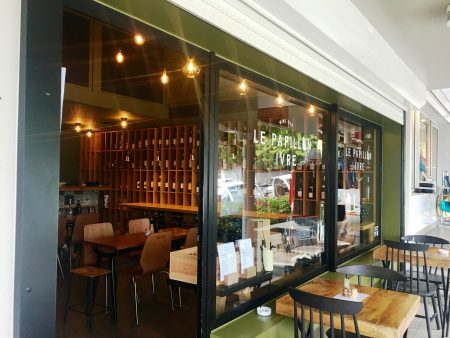 This très chic little wine bar has much to offer – cheeses, charcuterie, fois gras, salads and tapas-style dishes of this and that. All good-to-go. Proprietor and sommelière Sophie knows her wine, and she’ll have some excellent suggestions to pair with your choices. Sophie makes a mean mousse as well. Night owls take note – they are open most nights ‘till midnight. 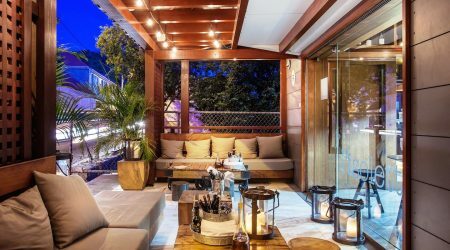 Alternately, you can take your vino and find a seat at the long bar or claim one of the tables, indoors – in the AC – or on the little awning-sheltered terrace. Les Amandiers, St-Jean; Hours: Mon-Sat: 12:00 pm – 12:00 am; Note – If you have time for a little shopping pre-or-post your visit, (And why wouldn’t you? You’re on vacation.) check out the browse-worthy French Indies Design shop next door, and we think you’ll find the neighboring concept store Sea Spice St. Barth, well, delicious. 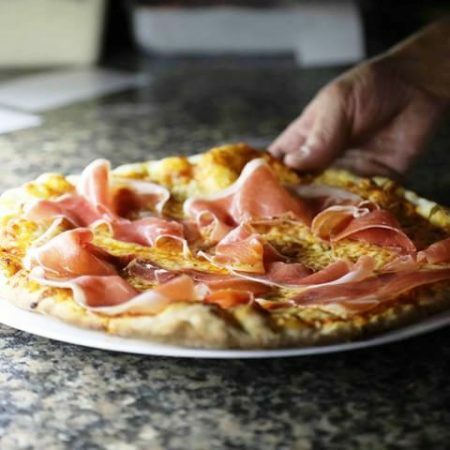 Pizza is often the first thought when it comes to take out and two options to pick-up thin-crust pies include L’Isoletta, the sophisticated little sister of the acclaimed island Italian restaurant L’Isola. While you are waiting, enjoy a glass of wine on the lounge-y like covered terrace. Just up from the harbor in Gustavia, it’s a see-and-be-seen kind of place. Rue du Roi Oscar II; Hours Daily 11:00 am – 11:00 pm. Closed Monday. 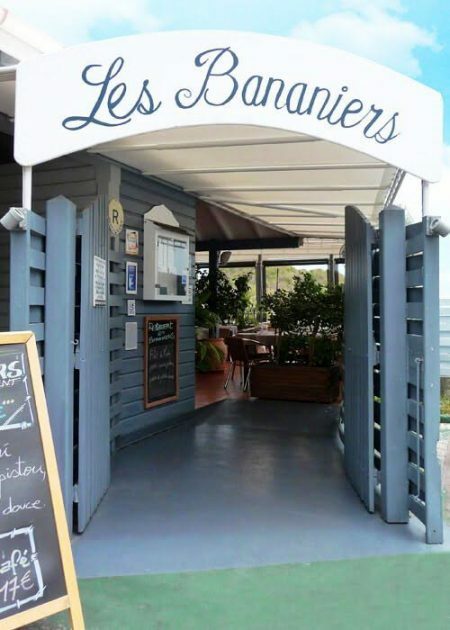 If everybody’s hungry and you’re in a hurry, swing by Les Bananiers located adjacent to the famous La Petite Colombe bakery in Colombier. It’s not-for-nothing that you see folks hustling those boxes out their door. The pizza menu is extensive but our favorite is the old-school pepperoni. We love to have lunch or dinner in their restaurant too because their menu items are not only yummy, they are reasonably priced. 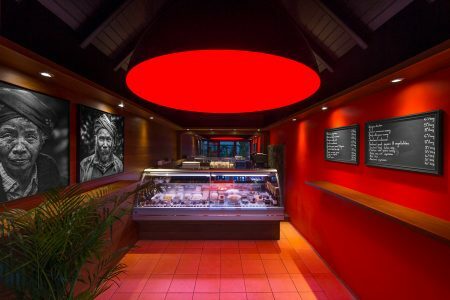 Les Bananiers, Colombier 97133; Mon-Fri: 12:00 pm – 2:30 pm; 6:30 pm – 10:00 pm. When you have a yen for Asian food – preferably poolside at your villa – check out Black Ginger’s menu for authentic Thai cuisine and call their TO GO line : 001.590 52 92 32. 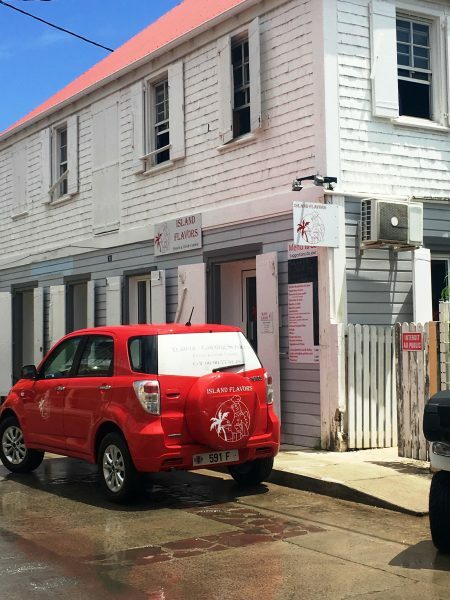 This Gustavia hotspot makes pick-up easy with a separate entrance and counter. Chicken satay makes for a perfect app to go with your sunset cocktails. Their curries are divine and don’t miss their signature dish Pla Pik Thai Dom – which is local fresh-caught Mahi-Mahi with black pepper. Rue Samuel Falhberg, Gustavia; To Go: Open daily from 11.30am to 2:30 pm and 5 pm to 8.30 pm except Sunday. 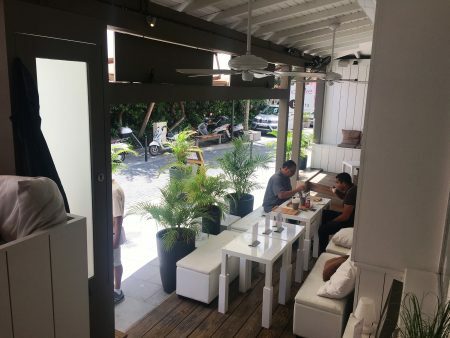 Located on the harbor between our St. Barth Properties rental office and our St. Barth Properties Sotheby’s International Realty sales office, the Baz Bar offers Sushi to go. 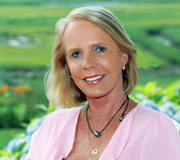 If you prefer to dine there, you will be entertained by visiting bands and, if you’re lucky, a chance to see Jimmy Buffett pick up a guitar and sing a set…just because he loves doing it. Open Monday-Saturday 7:00 pm to 1:00 am. 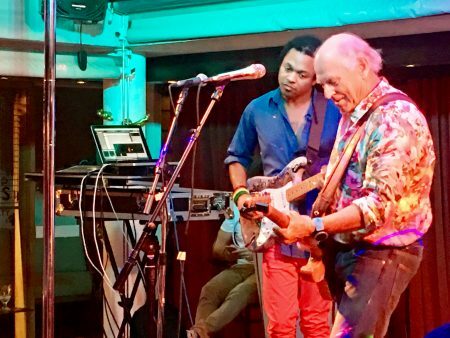 Jimmy Buffett loves to stop by the Baz Bar once in a while to give us an impromptu set of songs. Hope you are lucky enough to see him. BAZ BOATS TO YOUR DOOR – MINIMUM 4 PERS. 4 Miso Soups, – 2 Wakame, – 2 Sushi Appetizers, 1 Sashimi Moriwase; 1 Roy’s Special or Dragon Roll; 1 Shrimp Tempura Roll or Dancing Eel Roll; 1 Spider Roll or Rainbow Roll; 1 Bagel Roll or Eel Roll or Nagihama. The fabulous harbor front restaurant and bar, La Bagatelle offers their fabulous full menu to go as well as pizzas to go. The truffle pizza is outstanding and worth the 35 euro price. Located next to our St. Barth Properties rental and sales offices on rue Samuel Fahlberg. Open from 7:00 pm. Closed Sundays. 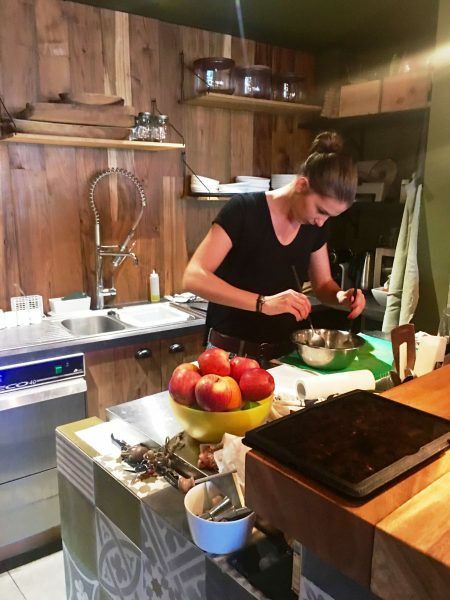 This entry was posted on Friday, February 24th, 2017 at 10:01 am	and is filed under Food & Wine, St. Barth Restaurants. You can follow any responses to this entry through the RSS 2.0 feed. You can leave a response, or trackback from your own site. This was a great article. There are definitely times when you want stay in and relax in your beautiful villa – but don’t want to cook. Thank you for the great information. Thank you Kim! I’m glad you enjoyed it. Once you try any of them, let me know your comments/reviews.